Ethiopian Foreign Minister Tedros Adhanom has condemned Saudi Arabia for its brutal crackdown on migrant workers in the kingdom. Saudi authorities have launched the weeklong visa crackdown on foreign workers,killing three people, including an Ethiopian national. “This is unacceptable. We call on the Saudi government to investigate this issue seriously. We are also happy to take our citizens, who should be treated with dignity while they are there,” Adhanom said on Sunday. Ethiopia’s top diplomat said Addis Ababa has formally complained to Riyadh and is now working to bring its citizens back home Saudi security forces on Saturday clashed with thousands of migrant workers protesting a new labor law. Two people were killed and nearly 70 others injured after police opened fire to disperse protesters in the capital Riyadh. More than 500 protesters were also detained. On Wednesday, the Ethiopian man was killed during another crackdown, prompting the Ethiopian government to announce efforts to bring home its citizens. Riyadh has announced plans to create jobs for Saudi nationals by reducing the number of foreign workers totaling some nine million people. Hundreds of thousands of workers have already left the kingdom amid tougher conditions for migrants. Foreign workers cannot change jobs or leave Saudi Arabia without the permission of their sponsors, who are often Saudi companies or individuals who provide workers to businesses for profit. Most of the sponsors take away the passports of the workers for the duration of their contract. 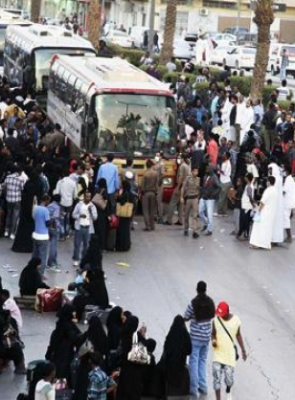 Human rights groups have criticized Saudi Arabia over the condition of migrant workers in the kingdom and called on Riyadh to abolish the sponsorship system for migrant workers.